Before the USB Power Delivery 2.0 spec became reality, battery packs maxed out at a charge of about 15 Watts (5 volts at 3 amps). PD 2.0 increased the max to 100W, but most of the batteries implementing PD 2.0 strike a balance of performance, heat, cost, and compactness by outputting about 30W. Some recharge at the same rate while others are much slower. However, the PD 2.0-based ZMI PowerPack 20000 ($80) offers 40 watts of power over USB-C to charge laptops while they’re in active use. And the 72 watt-hour/20,000 milliampere-hour PowerPack 20000 recharges itself at 45W. It’s faster in both directions than nearly every USB-C battery pack on the market. I used the PowerPack 20000 to charge a drained battery in a 2015 12-inch MacBook over USB-C, and it took about 150 minutes to fill the MacBook’s battery, which currently has a 4,220mAh capacity. (The original MacBook battery has over 5,000mAh.) This exhausted about three-quarters of the PowerPack 20000’s charge, based on its four LED display system. That works out to about 25 to 35 percent inefficiency—using about 54 Watt-hours to pass through about 35Wh—which is reasonable given battery physics and compared to peers. Recharging the PowerPack 20000 to capacity took about the same time. The battery doesn’t come with an adapter, which is a mark against it not on cost, but because it can be tricky to find a good adapter that matches the PowerPack 20000’s wattage. However, ZMI offers its own 45-watt charger for $20. Because of its high-wattage output over USB-C, you can actively use the battery to maintain a charge or increase stored juice while using a MacBook or MacBook Pro. On more advanced or larger-format MacBook Pro models, the battery pack may not be able to keep up with drain, but you’ll still be extending run time by several hours. The effective capacity of the PowerPack 20000 is equivalent to about one and a quarter charges for a fresh 12-inch MacBook, all the way to about two-thirds of the 15-inch MacBook Pro. 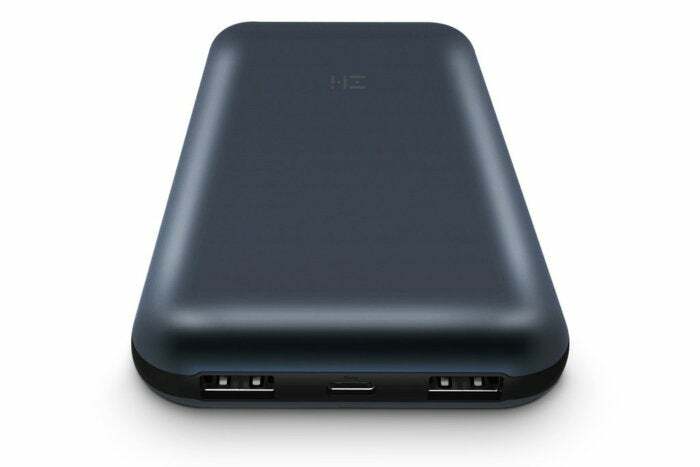 The battery pack charges and recharges through the same USB-C port, and includes two USB Type-A jacks as well. Each of them can charge from 5V at 2.4A (12W), 9V at 2A (18W), and 12V at 1.5A (18W), but the two together share a maximum 18W output. 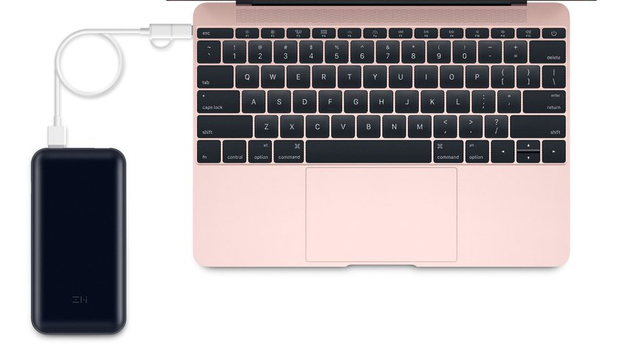 The PowerPack 20000 includes a USB-C power cable that handled charging the MacBook and recharging the internal battery pack. ZMI also includes a nifty USB Type A to USB-C/USB Micro-B—it’s a single cable in which the USB-C plug end is really an adapter with a plastic tether you can remove, revealing Micro-B for charging non-Apple smartphones and other devices. The battery measures 6.3 by 3.2 by 0.8 inches and weights just over 14 ounces. The company offers an 18-month warranty. The only quirk of the battery is that its sole button, when pressed, interrupts charging for a fraction of a second to check its internal status. It’s not a big deal, but it’s a little odd, and something I haven’t seen with other battery packs. The battery can be switched into a USB hub mode by double-pressing the status-check button, which changes a status indicator LED to blue. Fast, compact, well-designed, and a good bargain, the PowerPack 2000 battery is on top of the pack. It’s a great battery for on-the-road use.